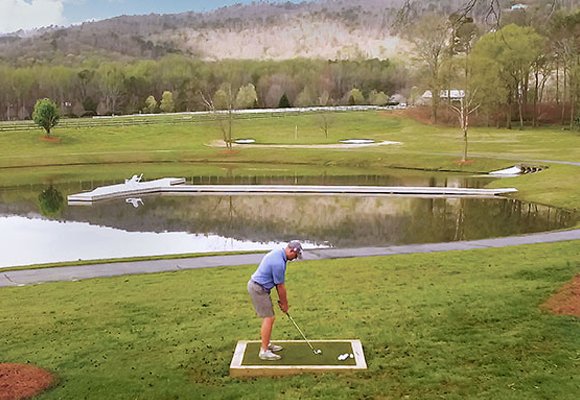 To take advantage of the beautiful pond on the property, we designed and installed a Tour Greens golf green and then placed tee boxes throughout the property so that our homeowner could practice all aspects of his game - including putting practice with his small children. We then installed a Versacourt multi-sport game with activities for everyone. 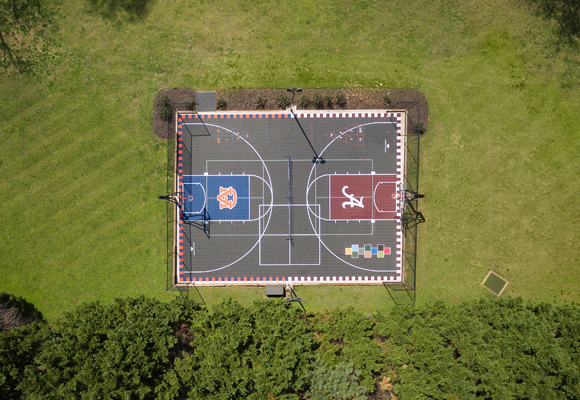 A small version of a full basketball court provided plenty of fun for afternoons with the guys, but we did not stop there. We added lines for pickleball and shuffleboard courts as well as 4-Square and Hopscotch for the kids. With three young kids, our family needed a safe place for the kid's to play and to give mom a break. So we outfitted the backyard with synthetic grass from XGrass giving the kid's a playground of their own.